Cycle through menu options by pressing Menu repeatedly. Adjust menu settings by pressing the Up and Down buttons. Enter sub menu settings by pressing the Menu button from the main menu. Save and advance to the next menu setting by pressing the Menu button. Dark mode switches off the display until there is an alert. One discreet LED will remain illuminated so you know the C550 is operating correctly. During an alert, the display will function as normal. If you press any button when Dark mode is on, the display will function as normal so you make the necessary adjustments. The display will switch off again after a few seconds. Whisper mode keeps the audio muted when you are under the speed limit. If you go above the speed limit during an alert, normal audio will resume until you slow down again. Whisper mode will include your speed tolerance setting. For example, if you have a speed tolerance setting of 10%, Whisper mode will be active until you are going 10% above the speed limit during an alert. Note: If the speed limit at a stored location is not known, Whisper mode will not function and the alert will be heard as normal. Custom alert distances allow you to individually adjust the warning distance for each type of alert. If you don’t want to receive warnings for any particular type of alert, you can set the Custom alert distance to OFF. We recommend that you also switch on Variable warning distance, which automatically reduces the alert distance at slower speeds. Stored mobile cameras are locations where mobile cameras are often seen. 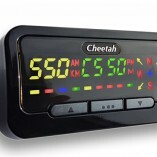 The C550 is not a radar or laser detector, so it will not “detect” a live radar or laser gun. Safety locations are used where it’s good to have some advance warning of nearby cameras, but you wouldn’t receive a ticket in your direction of travel. For example, if there is one red light camera at a 4 way junction, the 3 non-enforced directions would be Safety locations so you are aware there is an issue with red light running in another direction. Information locations are used where it’s good to have some advance warning of areas where you may want to pay extra attention, such as dangerous curves. Non-ticketing cameras are cameras that do not issue fines. Opposite direction alerts are warnings when you are driving towards an active camera, but could not receive a fine from the camera in your direction of travel. Highway cameras describe cameras on faster roads. During a point to point speed zone, your average speed is calculated from the start of the zone to your current location. If the zone is very long, your average speed may be measured between any camera or group of cameras and it would be possible to have a low overall average speed, but have a high average speed between any two points. So it’s important to always remain within the speed limit. On / Off for each type of alert. Overspeed alerts are beeps that will be heard if you remain above the speed limit when approaching a database location. You can choose to switch these on and off for each type of alert. If you switch off Overspeed alerts you will hear the normal warning for each alert, but you will not be notified if you exceed the speed limit when approaching a database location. Overspeed alerts work with Continuous overspeed warning and Alert speed tolerance to fine tune how you want your C550 to operate. Please note that Point to point speed camera zones are excluded from the Alert speed tolerance feature. Variable warning distance automatically reduces the alert distance at slower speeds. The Alert speed tolerance allows you to increase the alert activation speed to an amount above the speed limit. For example, if you select 10%, you will not receive any overspeed warnings until you are more than 10% above the speed limit. Alert speed tolerance also works with Whisper mode. Average Speed Zones are excluded from this setting. Continuous overspeed warning controls the frequency of overspeed alerts. Switching ON will give an overspeed alert regularly when you are over the limit. Switching Off means the overspeed alert will beep just 1 time and then 1 more time if you exceed the limit during the alert. There will be a second reminder beep 75m from the stored location if you are still driving over the limit. This controls the alert’s initial heads-up chime. This is the beep that plays at the start of an alert. This controls the confirmation chime as you pass the alert location. The speedometer of your car is not generally precise. By law, manufacturers must never display your speed as more than it actually is. To achieve this, the car speedometer generally reads lower than your actual speed. This is to account for varying tyre pressures and other mechanical differences. If your speedo is above or below the C550’s displayed speed, you can adjust the C550’s accurate onboard GPS speedo to more closely match the vehicle’s speedo. This controls the GPS signal lost and found tones. These tones will notify you if the C550 loses its GPS signal at any time. If you want to have a completely silent start up, switch this OFF. 1 = Kilometres per hour. 2 = Miles per hour. This option will erase all your stored personal locations. Press Menu to confirm your choice. This option will restore the factory installed settings. If the GPS atomic clock is not displaying the correct time, you can offset it to match your current time zone. UK customers should select “00”, or “01” during British Summer Time. The Personal Speed Limit function will play a tone each time you exceed this set speed. 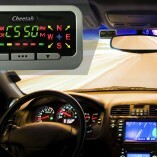 PL will be shown on the display for as long as you remain above your Personal Speed Limit. You can resume normal display by pressing the Down arrow once. If you do not wish to use this feature, select 00. You can adjust the C550 volume by pressing the Up or Down buttons during normal driving or when stationary. During an alert, the Down button performs different functions as described below. Personal locations are points that you can save in your C550’s memory. You will be alerted the next time you drive towards this stored point in the same direction. You can store up to 64 personal locations. You must be driving (and have GPS lock) to be able to save a new personal location, so please ask a passenger to operate your C550 for you. To store a new personal location, press and hold the UP button when driving past the point you want to store. To delete a single personal location when driving, press and hold the DOWN button during the alert. You can delete all personal locations via the main menu. Alert mute allows you to quickly mute the audio of the current alert by pressing the Down button. You can resume the current alert by pressing the Down button again. The C550 display will continue to operate as normal if you mute the current alert. Alert cancel allows you to quickly cancel the current alert by pressing and holding the Down button. The C550 will return to normal driving mode and will alert to the next database location as normal. Press and hold Up and Down together for a few seconds to start Demo mode. You will hear a number of alert examples. Press and hold any button when connecting the USB cable to your PC to power up the C550 and make menu changes. You may see a “USB device not recognised” warning on your PC, but your C550 will update in the normal way after you disconnect then reconnect it.